✔ These over-sized Mylar foil balloons are the perfect accessory for a Animal theme party & will bring a smile to your child's face. ✔ SIX FOIL balloons are included featuring Lion, Tiger, Zebra, Giraffe Monkey and Cow. Sizes are 28 and 22" and Twelve Latex Balloons 18". ✔ Balloons are re-usable; celebrate and then store away for the next child's birthday party! String & helium not included, but can be purchased separately at a party store like Party City, Dollar Tree or the grocery store. ✔ We do not recommend filling these balloons with a small tank meant for home use, as the nozzle on home tanks may not fit the balloon. ✔ BUY it NOW ! ✔ - 42 Pcs Birthday Party Supplies Safari Jungle Zoo Animal balloons and cupcake toppers decoration kit. 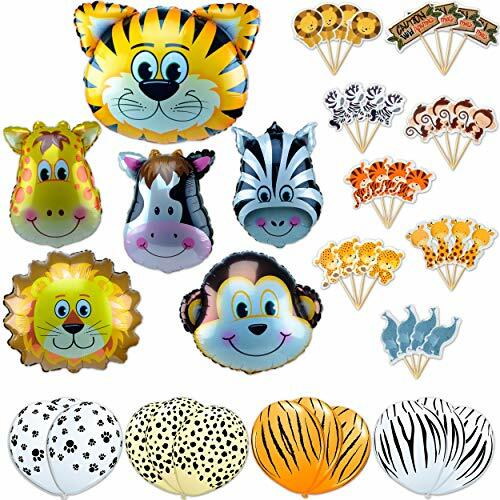 ✔ - 6-PACK LARGE FLOATING Animal Foil Balloons (Lion Tiger Zebra Monkey Giraffe and Cow) -Both sides are shown. ✔ - 12-PACK LARGE LATEX FLOATING DECORATIVE BALLOONS and 24 CUPCAKE TOPPERS. ✔ - DELIVERED UNINFLATED....JUST ADD HELIUM AND ENJOY YOUR PARTY. ✔ - CELEBRATE and then store away for the next child's birthday party! Every item was individually inspected for any defects; Sold by SAKIBO, LLC, Please find our logo individually printed on all products. If you have any questions about this product by SAKIBO, contact us by completing and submitting the form below. If you are looking for a specif part number, please include it with your message.